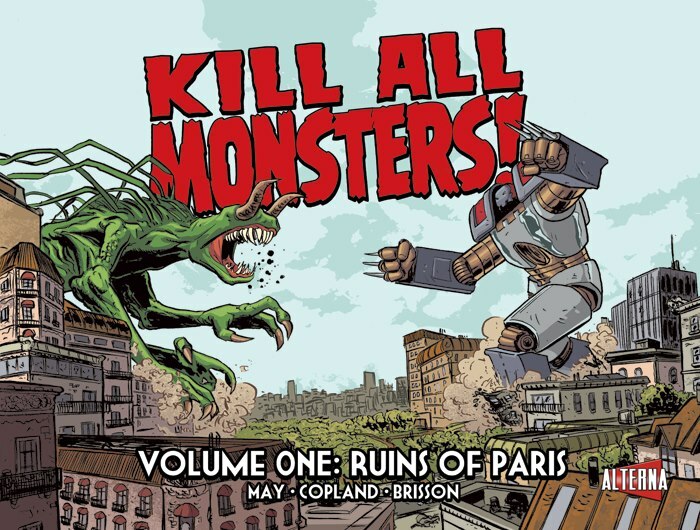 Michael May writes the Kill All Monsters! 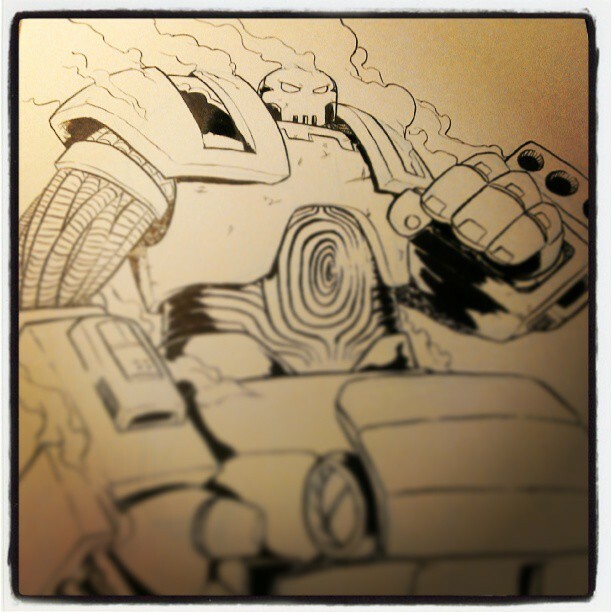 webcomic with Jason Copland and talks about comics with Robot 6. 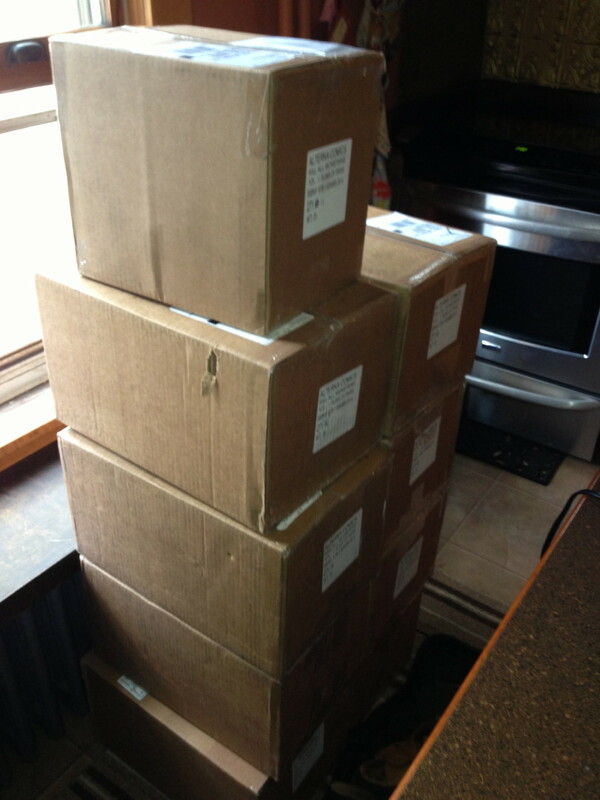 Kill All Monsters, Volume 1 shipped from the printers last week, which means a couple of things. 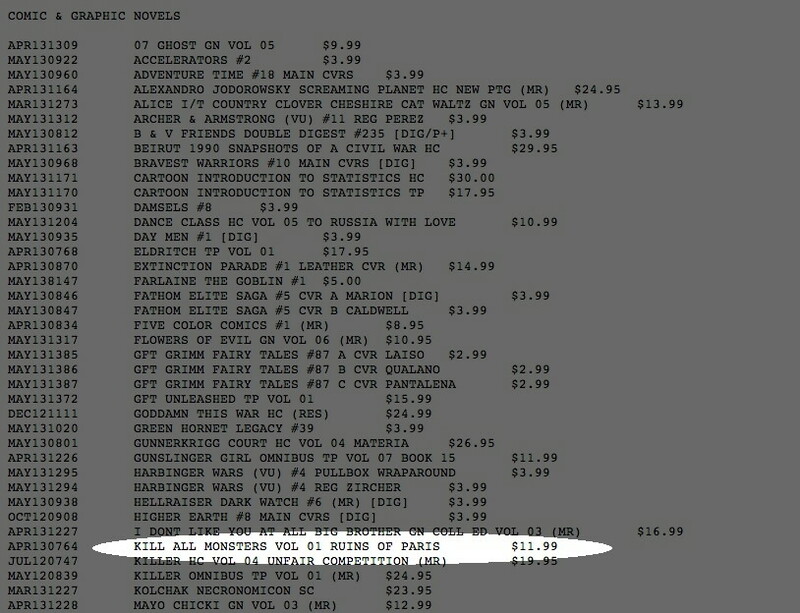 First, it means that it’s available for pre-order on Amazon (they don’t list a release date yet, but stay tuned) and since Diamond should also be getting their copies, it should also be in comic book stores soon. The good news for Kickstarter supporters is that I just got my copies, so I’ll be starting work on getting those out next week. They don’t really fit with my kitchen decor anyway. This entry was posted in KAM! 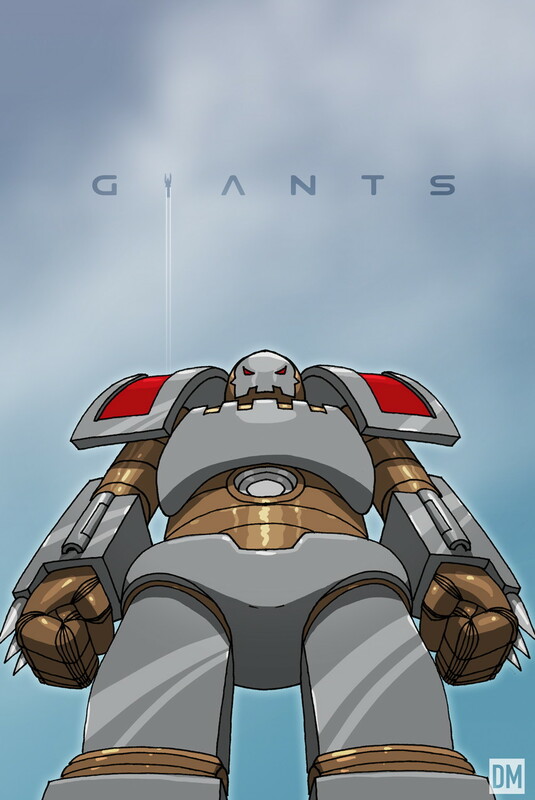 News and tagged comic update, interviews, Kickstarter on July 1, 2013 by Michael May. SpringCon was great last week. 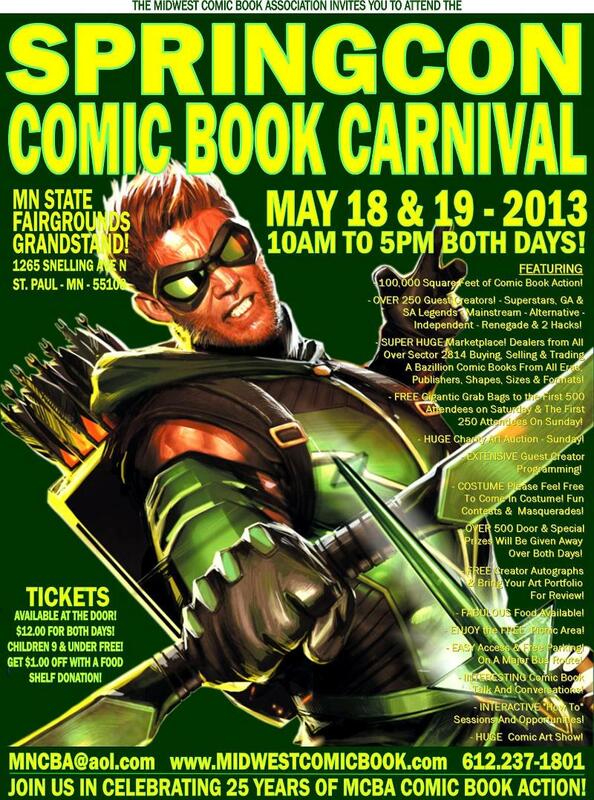 For those who aren’t familiar with it, it’s the larger of the two Minnesota conventions put on by the wonderful folks of the Midwest Comic Book Association. 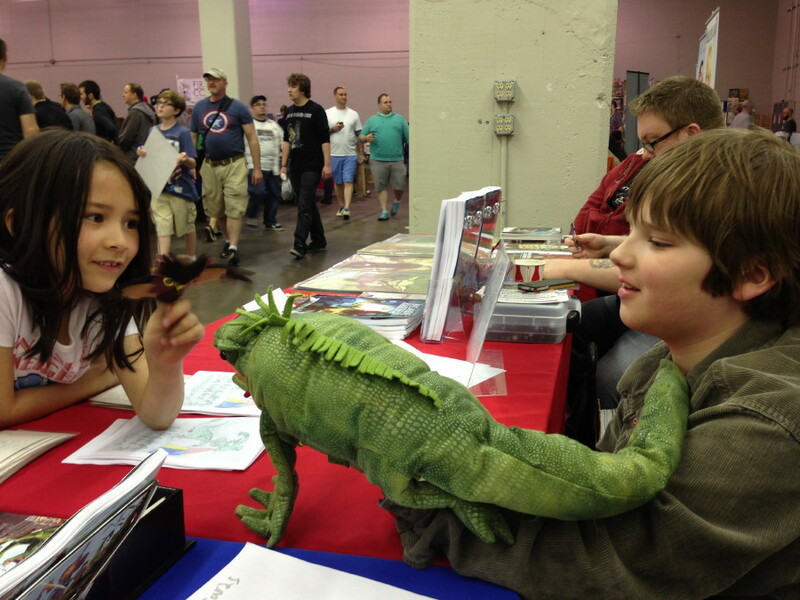 FallCon is a one-day show in October, but SpringCon runs Saturday and Sunday, usually in May. 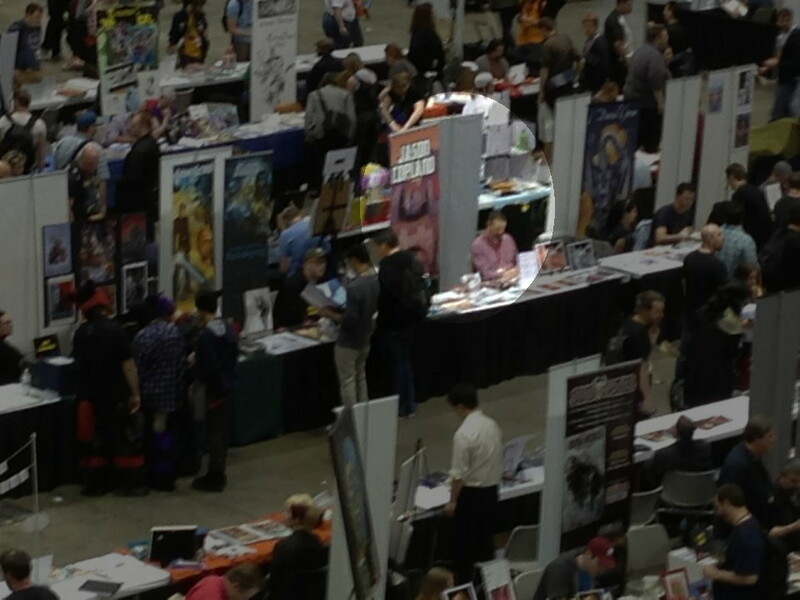 The Minneapolis/Saint Paul area has a great comics scene and the MCBA goes out of its way to treat creators like royalty, so there’s always a lot of participation. Both conventions are fantastic, family-friendly shows and highlights of my year. My wife was out of town for a friend’s college graduation, so David and I hung out together all weekend. 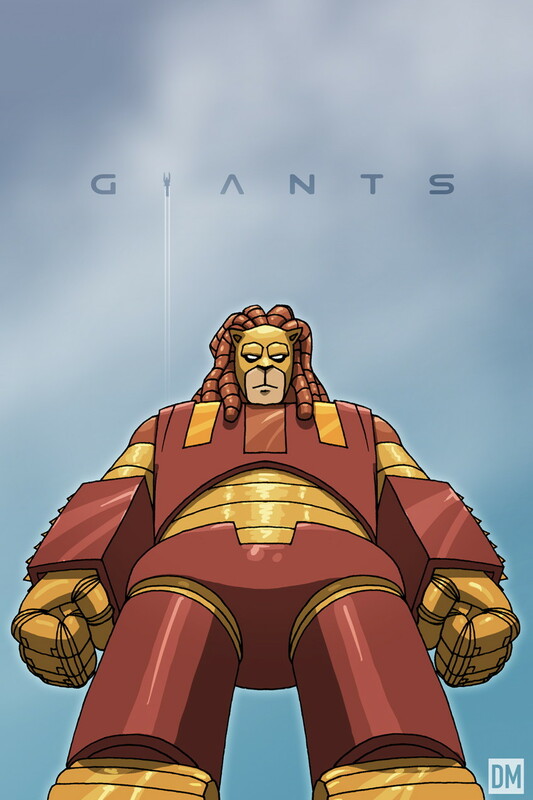 David made the second issue of Hulkasaurus, his series of mini-comics about his own giant monster, and I had several copies of Kill All Monsters left over from C2E2. KAM did very well and I sold out early on Sunday. 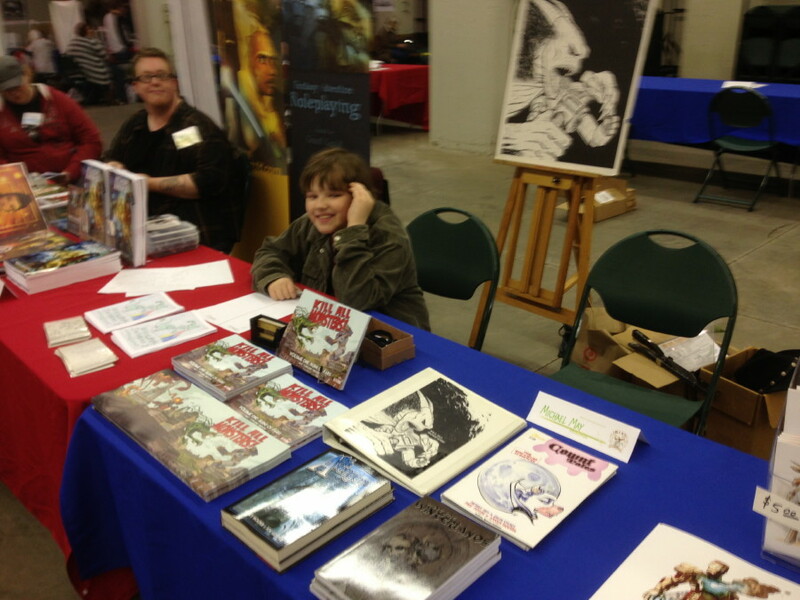 David sold most of his copies of Hulkasaurus #2. 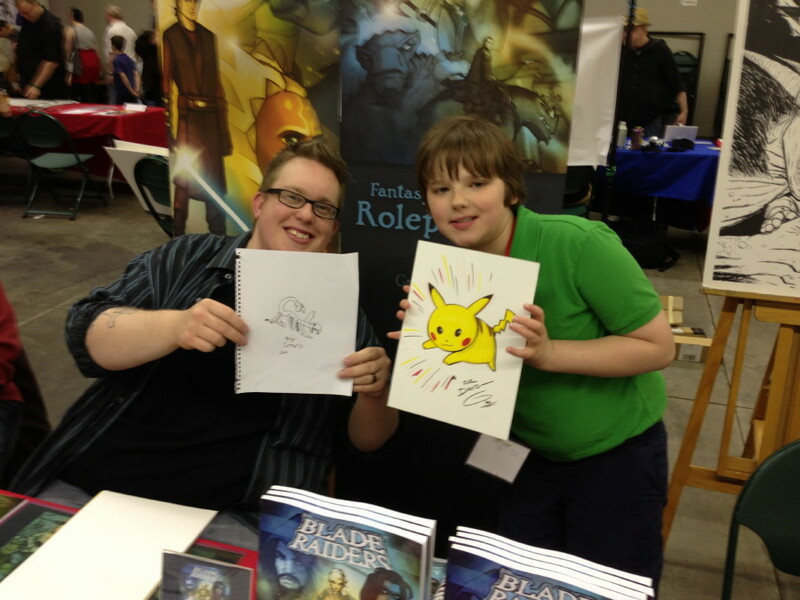 A couple of other friends of mine were also exhibiting with their kids who did very well all weekend. It’s great to see children getting into making art and comics so early, and even greater to see the local community support them so much. As usual, we sat near Grant Gould who’s always amazing with kids. He and David did an art trade, with Grant’s drawing one of David’s favorite characters and David’s drawing something Grant had mentioned earlier: a dinosaur/scorpion hybrid. 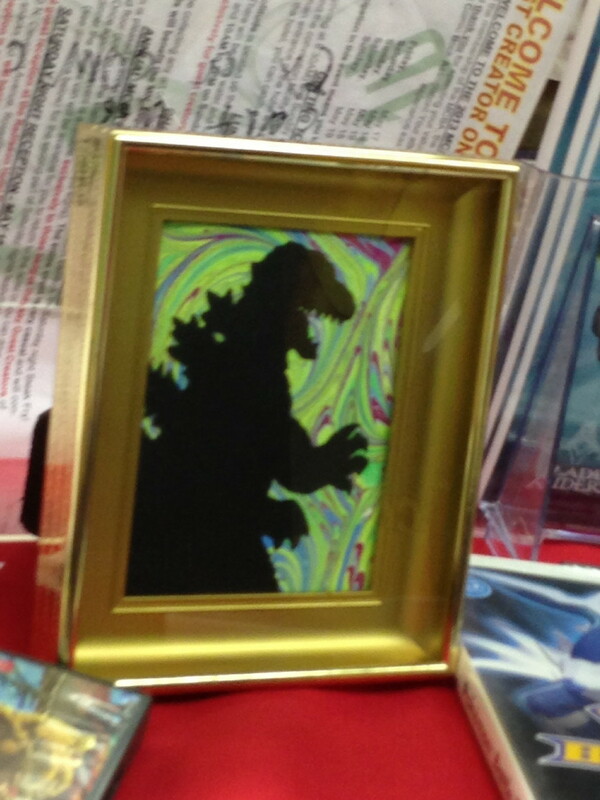 In addition to talking to people – and I know I’m leaving out so many of them; I’m sorry – I bought a bunch of comics of course and a couple of pieces of art, including this Godzilla silhouette by Jennifer Menken. 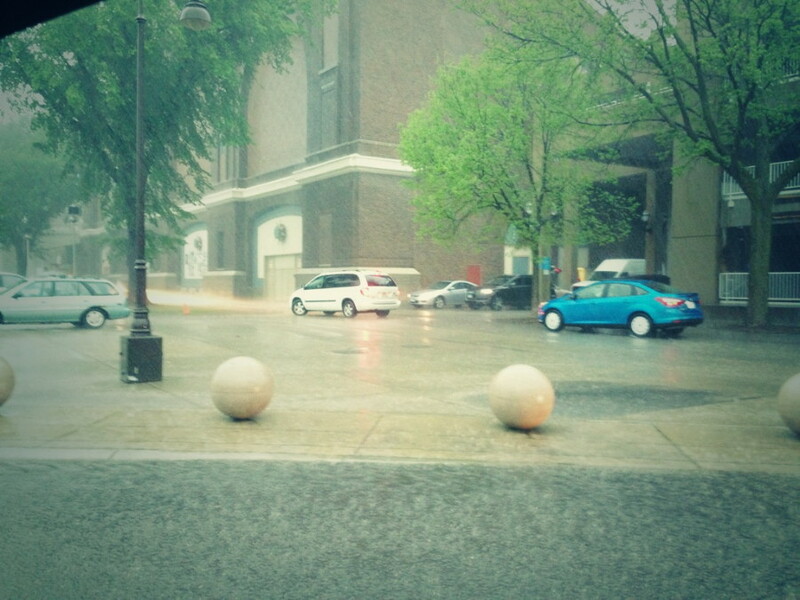 Not that that “dampened” anyone’s fun. It was a great time and thanks again to the MCBA for hosting! This entry was posted in KAM! News and tagged conventions on May 28, 2013 by Michael May. C2E2 was amazing. It was great to hang out with Jason in person for the the first time in a few years. It never feels like it’s been that long, because a) we talk quite a bit online, and b) that’s just the kind of friendship we have. Kill All Monsters did extremely well at the show. We almost sold out of our supply, but still have several for SpringCon on the 18th of this month. I’m a little concerned about selling out early at SpringCon, but we’ll see how that goes. This entry was posted in KAM! News and tagged conventions on May 9, 2013 by Michael May. The Kickstarter ends on Friday, but whatever the final total is, it’s already far exceeded my and Jason’s hopes for it. Everyone’s been so supportive and encouraging, we’ll never be able to express our gratitude appropriately. Same goes for those who’ve helped spread the word. I’ve got a couple of more links to share from the past week. 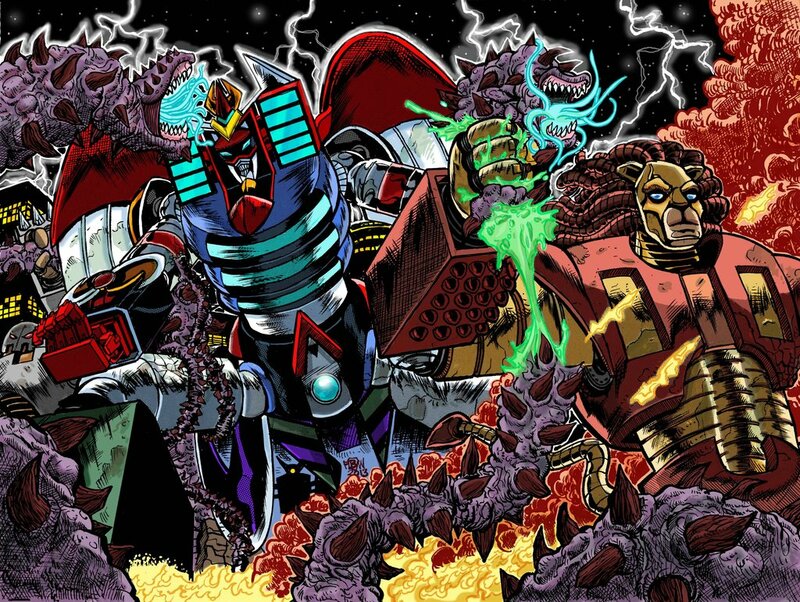 Matthew Meylikhov wrote a great Kickstarter Spotlight about us for Multiversity Comics, calling Kill All Monsters “essentially what all Godzilla books should be, but few are, focusing neither on one option [robots punch monsters!] or the other [humans talk about feelings!] and instead celebrating both, mixing it up in a style that flows seamlessly.” It’s a fun review and Meylikhov is a funny writer. You should check it out. Meanwhile, Rick Hansen wrote up his reflections on C2E2 for Comic Impact and mentions picking up Kill All Monsters. He let us know on Facebook that he liked it so much he went ahead and chipped in a little Kickstarter money too. Thanks so much to both Matt and Rick. 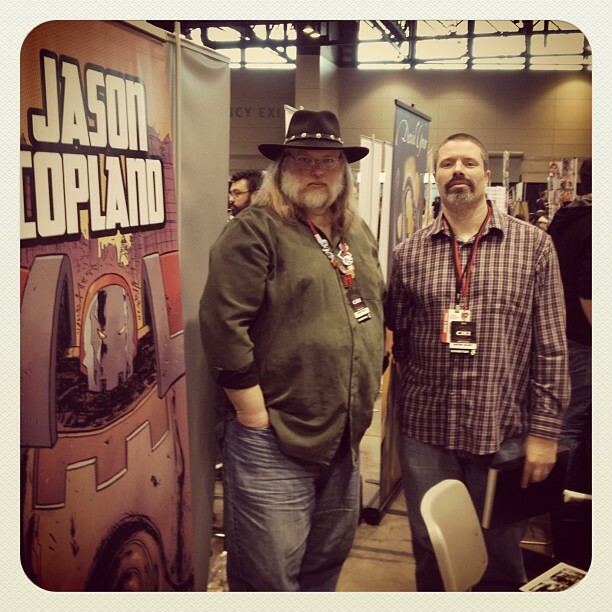 Jason and I love hearing that people are enjoying the book. If you’ve written about Kill All Monsters and I haven’t shared it here, please don’t be shy about forwarding your links. I’d love to see and post about them. This entry was posted in KAM! 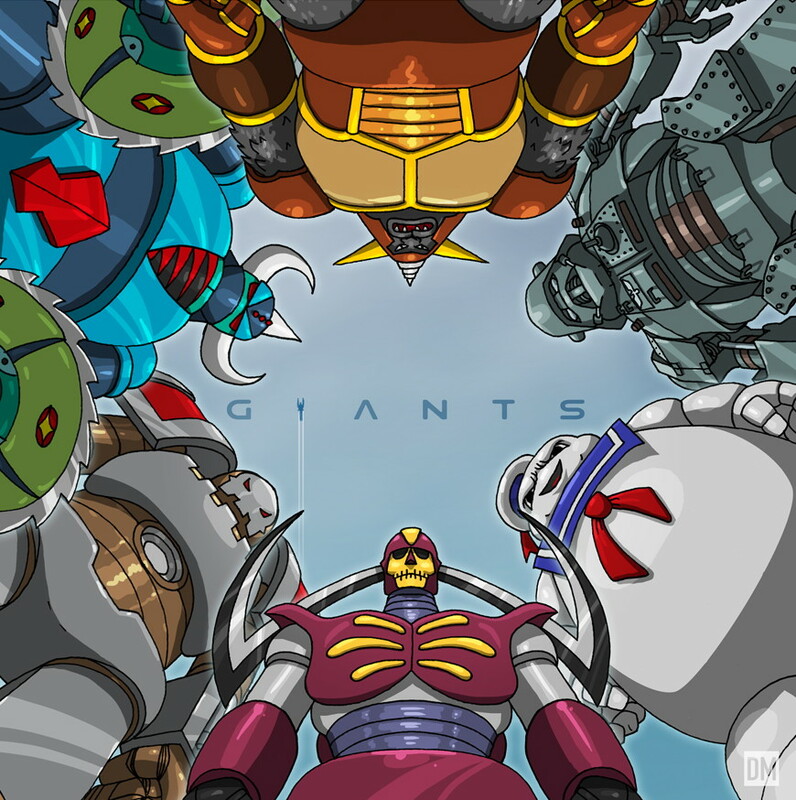 News and tagged Kickstarter on May 8, 2013 by Michael May.